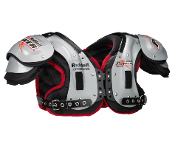 Endzone Sports stocks a full range of football shoulder pads that cater to every player. Not only do we carry sizes to suit adult and kid-sized players, we also carry pads specific to each players position. 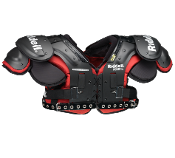 At Endzone Sports, you are sure to find the shoulder pads you need to fit your specific playing situation and budget! 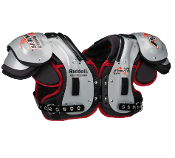 We offer the best in football shoulder pads from Douglas, Pro Gear, Xenith, Schutt and Gear Pro Tec. 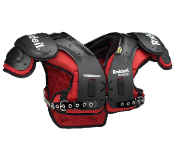 Schutt football shoulder pads are known and trusted by youth, high school, college, and pro NFL players all over the world. Schutt's innovative designs are fit for players of all ages and skill levels, Schutt shoulder pads are fair priced but perform well on the field. Douglas football shoulder pads are trusted by 85% of Division 1-A college football players, and many NFL pros, Douglas pads provide advanced protection at more affordable price-points. High quality, innovative styles are built tough to take the hardest hits, and protect players of every age and skill level. 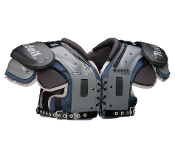 Pro Gear football shoulder pads are spreading like wild fire as another popular air management shoulder pad. 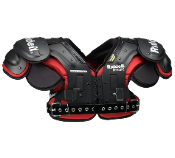 Custom shoulder pads worn by many division 1 football programs and some NFL players these shoulder pads are a great and affordable option for any player looking for air management shoulder protection. 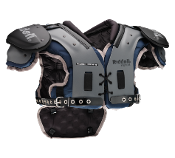 Xenith football shoulder pads are revered for their range of motion and great look. A good option for any playing looking for range of motion and shock absorbing protection. 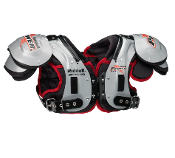 Gear Pro Tec football shoulder pads are known in the industry for their Z-Cool Technology, which keeps players cool and dry while improving impact absorption, Gear Pro-Tech has developed some of the most interesting, innovative, and affordable football shoulder pads of the passed few seasons.